I promised one more video prior to launch, so I thought “why not play a whole mission all serious like”. I did fairly well. Not 1st, or 2nd, or 3rd place well, but I’m happy. Btw, if you never get to experience being pwned at your own game, then you just haven’t made a game yet 🙂 It’s par for the course and I kinda look forward to it actually. Anyway, new video and I have 17 days left to finish the game. Press previews have been sent out, and I’m happy to provide more press copies. Just let me know… Additional preview versions will also be sent out later this week to a bunch of randomly and not randomly selected people here on the blog and on the forums. There are literally (by the classic definition of ‘literally’) many thousands of people here on the blog and forums. And I will be sending out far fewer keys than that. So if you don’t get a key, don’t take it personally…. the odds are low. Plus, the demo is right around the corner…. Nominations have closed, but you can still vote! Refreshed the page once more before leaving the house. What a foolish mistake I’ve made. Now I’ll be longing to watch this all day. I left a meeting because I got a youtube alert of a new video being posted haha. 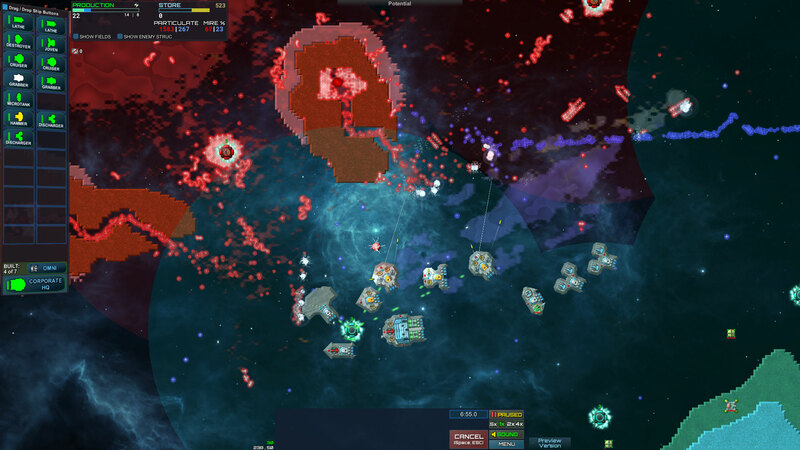 I would be interested in acquiring a press key to play Particle Fleet. I have 0 subscribers and have uploaded 0 videos to my channel, so I think that you can be very certain that I will provide mass exposure to your game, causing many more people to buy it. Haha. Can’t wait for the game to come out! Probably going to buy it on release day myself. And Virgil, *DO NOT WORRY ABOUT THE RELEASE DATE. * I don’t care if it comes out even a month or six months later; a broken or not fun game is not worth releasing, no matter how much of a “concrete” release date you’ve set. Excited to see what changes between now and release! All in all, game looks great, and I can’t wait. I like the picture this paints. I like it a lot. Making it rain! Virgil does everything on his own. He very much deserves the money he earns from game sales and we like to support him by buying the game. (Hopefully) only 17 more days to go! Looks fabulous as usual! Thanks for the changes with the ship aiming, it’ll make a big difference 🙂 Count me up for a wishlist conversion, buy yourself a drink with it :). I noticed the C shaped island at the bottom left got mired from both the top and bottom edges (on the right side of the island). It appears that the mire is reacting like these two parts of the island are connected with each other, even though it does not appear to be in the video. That’s a subtlety that many times doesn’t matter, but sometimes does. Mire spreads outward from the source onto any connected land. Mire, in terms of the lore, is related to rift space and the green energy collection areas in CW1 and CW3. You can think of it as ‘conducting’ through all connected land, but spreading outward from the source. So that island is all one land mass, it just has a channel cut in it. The mire doesn’t care that the channel affects the “line of sight” to the omni… it only care about the land being part of the same landmass. Harder to describe than to actually understand once you see it in the game…. think of it as a bubble that only affects that the Omni is connected to. It grows outwards but only the landmass its connected to can do anything with that bubble. Around CW3 pricing is the plan. Looks great! I’m excited for release!!! The game is looking awesome Virgil. I did have a quick question about Mire. Does it proliferate itself without an Omni present or particles hitting it? You’ve finished miring an island and move your Omni off of it. A few spare red particles hit the island and take back a few pixels. No other red particles make it to the island. Would you have to move your Omni back to retake those few pixels, or will the friendly Mire slowly retake them? It only expands when there is a driver on connected land, or a particle hits the land. So a single square of red won’t multiply on its own. Conversely, blue mire won’t spread on its own either. A Particle fleet video, huzzah! Hey virgil! Looking forward to playing this! As many people have said, don’t worry if you can’t hit the release date. Also, It would be cool to see a ship boss fight! Perhaps a massive ship can be the final boss? The game is looking amazing. I can not wait for it to be released. I do want to say one thing though. Wholly unrelated to the video, but still. When it comes to custom player-made missions, CW3 had one big flaw. The very low number of possible “characters” talking. You could change the pictures and names of the existing 8, but 8 was your absolute limit. And one of my ideas would have been severely limited, if not outright broken, by such a limitation. (Good thing, then, that I never got around to actually making it). But this time I would love to do it right, and if you could raise that number without it causing some other problem, that would be very appreciated. Either way, I look forward to creating some interesting maps, and even more-so to playing the ones you’ve made for us. Thanks for the video Virgil! Looking forward to playing the release! Been a fan since Creeperworld 1! At around 15 minutes in, i noticed that the particles were being forced downward… so the “arrows” seen in previous videos are still implemented? Also seeing the snakes reminded me of something i had forgotten to ask. Will the snakes separate or still be connected when they go through a wormhole? There are “fields” that an be on a map to push particles around. In the upper left info box there is a “show fields” you can toggle on to see them on the map. Teleporting a particle has an option to include the whole connected group, to break the group, etc. In the story missions I have the portal teleport the group and maintain bonds. So a whole snake gets sent through. Logging on after just “Spending time with the Mrs.”To seeing this video and all these posts made my night perfect… Hers not so much, lol no cuddles for you! Particle fleet video! That creep particle effect looks sweet! It looks like the liquid from Portal 2. Getting first or close to it will always be a miracle until the scoreboards become cheatproof, so good thing you’re happy. Are we going to see the Emergent again? Given that the game’s subtitle is Emergence, I can only assume that they play a critical role. Do we have a rough timeframe for the demo, as in next week, next month, next year, next decade etc.? Emergent i think he said is a thing in the later levels and can be disabled in the create levels thing. 13 days remain. How far on track are you? ahead. on time. late? your close enough that warning of a possible delay shouldn’t hurt. we are you fans and we love your games. question. is it better to buy it here or on steam??? Whatever you are most comfortable with. Note that if you want your review on steam to count (towards the game’s overall ranking), whether that review be good or bad, you have to buy it on steam. Valve just very recently changed that policy. i personally would get it on steam. much easier to put it on a new PC if you get one. You know V since you put the steam page up, this is the first time with a game release i have seen where people havent been spamming the whats the release date question.. bet you dont miss those either haha. Now youre just going to get the above, are you on track questions. Have a good weekend everyone. Its so frustrating. I don’t have the game, but I watch these “Let’s Play” guys playing it, and I’m thinking, “you’re doing it wrong. You need to harvest those energy pods with a lathe or HQ.” They play for free what I would pay money for now. And yep I have to have the demo out early next week. Fingers crossed…. so where are you going to post this demo? any email spam to people who have already bought your other games? ck back here Monday? I’l blog, tweet, facebook, and forum about it. so close to launch. I really really want to play this game! Virgil you have changed the face of tower defence games with Creeper world and each installment kept things intresting cant wait to see how Particle fleet plays apart of this. Stalking the blog/forum more than usual. Testers keep up the good work with the bugs. Cant wait to get my hands on it. Me too. I’m checking around 4 times a day for any news or even a demo. Not that I need a demo to decide. I’ve watched enough gameplay videos to purchase day 1 without a demo. also where is the demo? Be sure to check out the forums, a lot of discussion goes on there. Virgil stated on there that he hopes to release the demo as early as tomorrow (September 27th) or on the 28th. So I’m sure we can expect it soon! I am very excited for this game. I am ignoring other game sales to make sure I have the cash and time for where it really belongs, here! I don’t think I’ve ever marked down a game’s release date in my calendar before, or even considered a day one purchase. Until now. I have even booked the day off work, as a holiday, so I can get into the game right from the start. that is why I sing this song. One thing I’ve been thinking about is the energy. I really like that you get energy both from the pods and from the mire. However, I can’t see anywhere on the display your current energy usage, like in the CW games. Maybe I’m missing it or it’ll be added later (whitin two days?). It may not be needed as much in PF as in CW, but I would still be happy if it got added into the game. Otherwise. Great job, really looking forward to the game!